An alert reader noticed the mention of the old Bread & Kabob here on BCR earlier this week, and the listserv-fueled rumor of a cash crunch, and wrote in to say that he's noticed that "lots of work has been going on in Bread and Kabob the last week." I drove by yesterday and also noticed some recent changes on the inside, so looks like the words of woe may have been premature. If so, it'd be good news for that stretch of West Main, which is far sleepier than the rest of the resurgent Brightleaf district immediately to its east. The Board of Adjustment met today to consider the special use permit for The Chancellory at Trinity Park and voted... to defer a decision yet again, this time until July 24. The stated reason for the delay is to yet again give time for all parties to try to reach an agreement anew. Interestingly, the Trinity Park Board Association will hold elections between now and the July 24 date, which adds another interesting dimension to the picture. Credit to Jim Wise at the N&O for breaking the news this evening at this blog post. A drive through Brightleaf. No, not Brightleaf Square, the other one. Coming back up US 70 from a dreaded shopping run to Brier Creek, I decided to turn off and take a look at the so-called Brightleaf subdivision that's going in off of the highway. This "master planned community" will feature upscale vinyl siding-clad houses intermingled with half-million dollar homes (non-vinyl clad, of course). It will be nestled amidst stands of wooded pine (those that survived the bulldozer) and, once the spray-on green chemicals have taken root, I'm sure the grass will even look natural. Brightleaf will also feature swimming pools, tennis courts, and other recreation facilities that duplicate those you already pay for via your local taxes, but choose not to use. OK, I'm being harsh; I admit it, I am a fan of the old, historic neighborhoods and am more than a bit biased against new subdivisions. Brightleaf actually looks surprisingly tasteful as these things go (compared to some of the things getting thrown up in Spraleigh, at least!) The developer seems to be making a legitimate attempt to incorporate environmental sensitivity (such as respecting the natural grading of the land, preserving creeks, adding nature trails, etc. ), and worked with Audubon International's standards to develop Brightleaf as a so-called sustainable community. However, there were two things of particular interest from an all-Durham perspective that I want to take a moment to dwell on. Downtown Durham, Inc. has reported that Durham has been ranked #1 out of all the metropolitan areas in the US for highest percentage of workers in the "creative class." The rating, from the statistician who does reports for Richard Florida, the inventor of the term and guru of the movement, which argues that an intellectually- and creatively-oriented workforce is a key to economic success in the future. Durham beat out San Jose, Washington, DC, and Boulder for the top position. From the N&O's Bulls Eye blog, the old Joe and Jo's space just inside the Loop is supposed to reopen on March 5... but in any event, "by St. Patrick's Day," says new owner Malachy Noone, which of course is a necessity given the new space's spin as an Irish pub. Jim Wise reports that some of the old Joe and Jo's staff will return to the space, which is good news; if Noone (and Durham) are lucky, so too will the space's rep as the center of the downtown culture and social scenes. In less happy news, the old Bread & Kabob has been stuck in renovations for ages, and now the rumor from the Duke Park listserv is that their plan to convert the space to a sports-pub named Gatsby has run into the small problem that the owners have run out of cash. Unconfirmed, but it would explain the purgatory-like limbo the West Main St. restaurant has been stuck in for months now. Update: A Trinity Park resident reported that there's been activity inside the restaurant over the last week so things may be back on track. Find out more at this update post. The Chancellory: Bottom of the 9th, two outs? Pardon the baseball analogy, but with The Chancellory at Trinity Park project coming back up for review this week before Durham's Board of Adjustment, from this writer's vantage, the odds of the project getting the necessary variances look slimmer than at any point in the past two months. To summarize how we got here: A local developer, Lou Goetz, first approached the Trinity Park Neighborhood Association about two years ago with his plans for a hotel/luxury condo project in the area, and actually won some significant support within the neighborhood, not least of which by moving an historic home that would be lost in the redevelopment to a new home up Watts Street. Trails again: N-S Greenway missing link funded? So you know you're a Durham news geek when you get a kick out of reading the staff memos on the City Council's work session agenda. But hey, that's what BCR is here for, right? Since we're on the subject of trails today, Ed Venable's memo requesting funding for several small sidewalk and traffic calming projects includes funding for an improvement project by the simple name of "Stadium Drive Sidewalk." Sounds like a small matter, but recent posts to the Durham Bike & Ped listserv has shown some ongoing confusion about precisely what happens to the greenway at Duke Street. 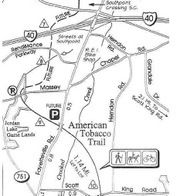 Looks like there's an explanation for Bill Bussey's optimism last week over the American Tobacco Trail's long-delayed "Phase E" missing link to connect the trail from NC 54 across I-40 and past the Streets at Southpoint. On the docket for this afternoon's City Council work session is a provision to shift $106,000 from older, funded-but-not-finished projects (more on that in a sec) to begin the community input and conceptual design phase of the ATT and the I-40 pedestrian bridge. The ATT missing link project has been frustrating because the 2005 Federal transportation bill included funds (thanks to the efforts of Congressman David Price) for completing the Durham/Chatham County parts of the ATT, yet almost eighteen months have passed with little action from city government to get things moving. The plan now is to use the $106,000 from other Durham capital projects to begin the community and design phase now, even as city government works in parallel to finalize the project agreement with NCDOT and to hire a consultant (likely Parsons Brinckerhoff) to work on project design. City staff estimate this could shave four to six months off of the completion date. For more details, check out this memo from the City Council agenda web site. According to the memo, almost $99,000 of the funding comes from 1996 bond funds allocated towards a pool replacement project. Memo author R. Lee Murphy points out that the bond money "must be used on a project in the Culture and Recreation Service Area of the CIP." Interesting that there's still money shaking around from the '96 bond eleven years later, especially given the fits and starts that local neighborhoods like Duke Park have encountered when trying to shake any funds loose from the city coffers for such projects. Still, no beef here whatsover with a very good end for these dollars. Here's to getting this rail-to-trail project back on track. Today's Herald-Sun has an update on the Pavilion East at Lakeview project touched on here at BCR earlier this week. 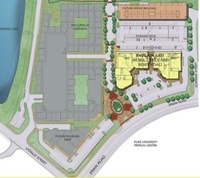 The site plan (at left) originally called for the lofts apartment and currently-under-construction Pavilion East at Lakeview to be joined by two other buildings, including a north-side structure that would be dedicated to commercial office space. Apparently, the developers have pre-sold all the residential condo units ($300,000 and up) alloted to the Pavilion East facility, and so will add 90 condos to the Pavilion North building -- more than three times the number of units in the East facility. This is an interesting sign of strength for the Durham condo market at a time when it's unpopular nationally. Then again, the quick-commute distance to the Duke and VA medical centers makes Lakeview a very attractive location for physicians and researchers looking for a short commute and a lower-maintenance residence than a single-family house. Local Board of Transportation rep Ken Spaulding has been lobbying hard that this expense should be borne centrally by NCDOT or spread across the state, since the repair work is necessary only because, to be blunt, NCDOT screwed up by not documenting in writing the specific paving instructions for the project. From a Durham perspective, this nearly $25 million hit is most likely to impact the timing of the East End Connector, which was already (under the likely Alternative #3 selection) $35 million over its $100 million budget.